NEW ORLEANS – The UW-La Crosse men and UW-Oshkosh women remain the No. 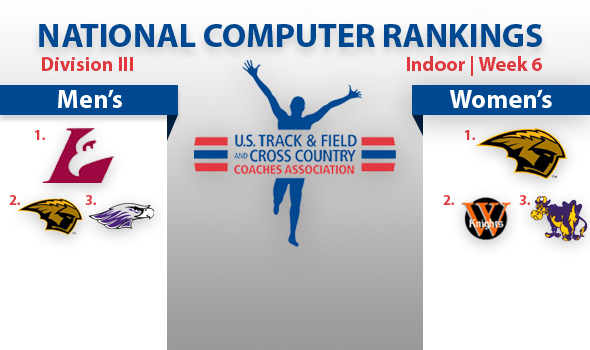 1 teams in the latest U.S. Track & Field and Cross Country Coaches Association (USTFCCCA) National Team Computer Rankings released Wednesday. Fresh off claiming the WIAC men’s title, UW-La Crosse was able to pull slightly away as the top team in the division, gaining 14.18 net points for a team total of 216.95. Isaac Vazquez’ rise to the top spot in the DIII long jump (24-11/7.59m) and David Stilin’s fourth-ranked run at 5000 meters (14:24.99) were the key components of the boost. No. 2 UW-Oshkosh gained 8.89 points for a team total of 185.32. UW-Whitewater (121.08), CCIW Champ North Central (Ill.) (112.22) and UW-Eau Claire (102.17) round out the men’s top five. Despite losing out on the WIAC women’s title to UW-La Crosse, the Titans of UW-Oshkosh remain the top-ranked women’s team in DIII, gaining 17.45 net points for a 179.57 team total. The Titans received the increase in points from Christy Cazzola recording DIII’s top qualifying time at 5000 in 16:40.52 and Abby Martin’s improvement to No. 4 in the shot put with a mark of 46-8 (14.22m). No. 2 Wartburg finds itself in the opposite position of the Titans, having won the IIAC title by a wide margin yet losing 52.41 net points to fall to a team total of 97.56. The Knights did not record a season-best among their potential NCAA qualifiers during their championship meet. Williams (91.14) jumped two spots to No. 3, Illinois College (80.97) fell a spot to No. 4, and Midwest Conference Champion Monmouth (Ill.) (73.74)improved two spots to round out the top five. The National Computer Team Rankings project how a team will finish in a National Championship Meet setting, rather than a triangular or dual. The final round of computer rankings, based on NCAA qualifiers, will be released February 27. The 2013 NCAA Division III Indoor Track & Field Championships will be held March 8-9 in Naperville, Ill.